With global warming on the rise, brands are more conscious about their carbon footprint and are opting for environmentally friendly products. 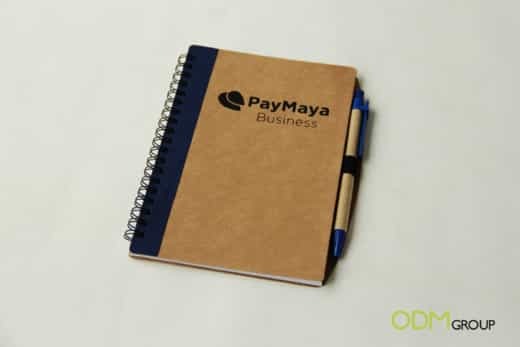 In one example of how sustainable materials can be used, Paymaya, the online payment app, are giving away eco-friendly notebook sets to customers, for their latest credit card promotion. This set comes complete with a notebook and pen, both made from post-consumer recycled paper. Products made from recycled paper are a great way of reusing paper destined for the landfill and this also contributes to tackling climate change. To add a personal touch and encourage brand recall, Paymaya have printed their logo on the front of the notebook. Additionally, there is a universal recycle symbol marked at the bottom of each page, showing that the notebook is made from recycled paper. Attracts customers: As well as being an environmentally friendly product, this GWP acts as a good incentive for new and current customers to make a purchase. Furthermore, they more feel more valued as a customer and will look forward to the next giveaway. Practical: It is a very practical product to carry around and use for everyday life. Whether it’s for taking notes in the office, in meetings, at school or at home. What’s more, your brand awareness will be heightened as the logo is exposed to other people. Customisable: To make your notebook look unique, it is easily customisable to best to suit your brand image. This could be a different size, shape or colour and include your logo. 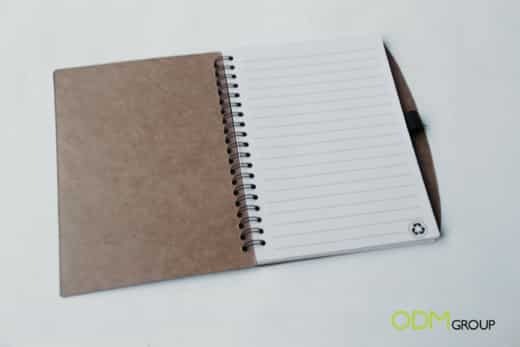 Looking to develop your own eco-friendly notebook for your next promotion? Inquire now with ODM.